Nestorianism was an ancient Christian heresy associated with Nestorius (c. 386–c. 451 C.E. ), Patriarch of Constantinople, who taught that Christ consisted of two distinct persons (human and divine Logos), rather than a unified person. Nestorius' view of Christ was condemned at the Council of Ephesus in 431 C.E. The christological debates surrounding his teachings led to the Nestorian schism, separating the Assyrian Church of the East from the Byzantine Church. Nestorianism originated in the fifth century out of an attempt to rationally explain and understand the incarnation of the divine Logos, the Second Person of the Holy Trinity as the man Jesus Christ. It taught that the human and divine essences of Christ were separate and that there were two persons, the man Jesus Christ and the divine Logos, which dwelt in the man. Consequently, Nestorians rejected such terminology as "God suffered" or "God was crucified," because the humanity of Jesus Christ that suffered was separate from his divinity. Likewise, they rejected the term Theotokos (Giver of birth to God/Mother of God) as a title of the Virgin Mary, suggesting instead the title Christotokos (Giver of birth to Christ/Mother of Christ), because in their opinion Mary gave birth to only the human person of Jesus and not the divine. Nestorius (c. 386–c. 451) was a pupil of Theodore of Mopsuestia in Antioch, and later became Patriarch of Constantinople. He taught that the human and divine aspects of Christ were distinct natures, not unified. He preached against the use of the title Mother of God (Theotokos) for the Virgin Mary and would only call her Mother of Christ (Christotokos). He also argued that God could not suffer on the cross, as he is omnipotent. Therefore, the human part of Christ died on the cross, but not the divine. His opponents accused him of dividing Christ into two persons: They claimed that proposing that God the Word did not suffer and die on the cross, while Jesus the man did, or that God the Word was omniscient, while Jesus the man had limited knowledge, implied two separate persons with separate experiences. Nestorius responded that he believed that Christ was indeed one person (Greek: prosopon). Opposed by Cyril of Alexandria, Nestorius was condemned at the Council of Ephesus in 431 C.E., which decreed that Christ is one person, and that the Virgin Mary is the mother of God. The Council's condemning pronouncement resulted in the Nestorian schism and the separation of the Assyrian Church of the East from the Byzantine Church. However, the Assyrian Church of the East refused to drop support for Nestorius, or to denounce him as an heretic, and it has continued to be called "Nestorian" in the West, to distinguish it from other ancient Eastern churches. However, the Church of the East does not regard its doctrine as truly Nestorian, but rather teaches the view of Babai the Great (see below), that Christ has two qnome (essences) which are unmingled and eternally united in one parsopa (personality). They granted protection to Nestorians (462 C.E.). They executed the pro-Byzantine Catholicos Babowai who was then replaced by the Nestorian Bishop of Nisibis Bar Sauma (484 C.E.). They allowed the transfer of the school of Edessa to the Persian city Nisibis when the Byzantine emperor closed it for its Nestorian tendencies (489 C.E.). The Assyrian Church produced many zealous missionaries, who traveled and preached throughout Persia and Central and East Asia in the seventh and eighth centuries. Also during this time many Nestorian scholars, having escaped the Byzantines, settled in Gundishapur, Persia and Muharraq in Bahrain, bringing with them many ancient Greco-Roman philosophical, scientific, and literary texts. At Nisibis, the school became even more famous than at Edessa. The main theological authorities of the school were Theodore and his teacher Diodorus of Tarsus. Unfortunately, few of their writings have survived. The writings of Nestorius himself were added to the curriculum of the school of Edessa-Nisibis in 530 C.E., shortly before the Fifth Ecumenical Council in 553 C.E. condemned Theodore of Mopsuestia as Nestorius's predecessor. At the end of the sixth century the school went through a theological crisis when its director, Henana of Adiabene, tried to replace Theodore's doctrine with his own doctrine, which followed Origen. Babai the Great (551–628), who was also the unofficial head of the Church at that time and revived the Assyrian monastic movement, refuted him and in the process wrote the normative Christology of the Assyrian Church, based on the doctrine of Theodore of Mopsuestia. "Nestorian" Christianity reached China by 635 C.E., and its relics can still be seen in Chinese cities such as Xi'an. About the same time, Nestorian Christianity penetrated into Mongolia, eventually reaching as far as Korea. 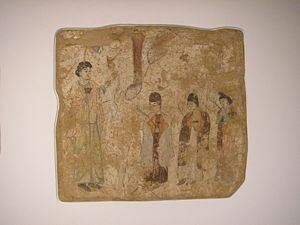 The Nestorian Stele, set up on January 7, 781 at the then-capital of Chang'an, describes the introduction of Christianity into China from Persia in the reign of Tang Taizong. However, the Nestorian community in China later faced persecution from Emperor Wuzong of Tang (reigned 840–846). He suppressed all foreign religions, including Buddhism and Christianity, which then declined sharply in China. A Syrian monk visiting China a few decades later reported that many churches were in ruins. Nestorianism was particularly active in the twelfth century, being a state religion of Khitan in the times of Yelü Dashi. It was also one of the widespread religions in the empire of Genghis Khan, and several Nestorian gravestones written in Syriac survive in what is today Kyrgyzstan. The Church experienced a significant revival during the Yuan dynasty. Marco Polo in the 1200s and other medieval Western writers indicate many Nestorian communities remaining in China and Mongolia; however, they clearly were not as vibrant as they had been during Tang times. The communities seem to have dwindled due to hostility from the Ming dynasty. The legacy of the missionaries remains in the Assyrian churches still to be found in Iraq, Iran, and India. There is evidence from within the hadith that Muhammad had contact with Nestorian Christians. Particularly of interest are the similarities between the Muslim raka'ah, or ritual prayer, and the genuflections performed by Nestorians during Lent. The Assyrian Church of the East is the intellectual inheritor of Nestorianism, which represents a historical continuity with Nestorian Christianity, though it is debated whether their christological doctrine is actually Nestorian. Babai's Book of Union is the principal Christological work of the Assyrian Church. In it, he explains that Christ has two qnome (essences), which are unmingled and eternally united in one parsopa (personality). Though this view is not strict Nestorianism, the teachings of the Assyrian Church have continued to be called "Nestorian" in the West to distinguish them from other ancient Eastern churches, despite the fact that Babai's Christology is basically the same as that of Catholicism and Orthodoxy; the Baltimore Catechism teaches that Christ is one "person" (like Babai's parsopa) but has two "natures" (Babai's qnome). From the point of view of the Chalcedonian theology held by most Western and Orthodox churches, the teaching of Nestorius forshadowed debates about the theology of the Eucharist in later times. During the Protestant Reformation, when some groups denied the Real Presence and the communication of attributes between the two natures, Protestants were accused of reviving the heresy of Nestorius. Some New Age groups such as Theosophy still embrace a Nestorian doctrine regarding Jesus Christ. ↑ Cyril of Alexandria, Third Epistle to Nestorius, with "Twelve Anathemas." Retrieved July 8, 2007. ↑ The origin of this confusion may be linguistic: for example, the Greeks had two words for "person," which translated poorly into Syriac, and the meanings of these terms were not even quite settled during Nestorius' lifetime. Gumilev, Lev N. Poiski vymyshlennogo tsarstva (in Russian, Looking for the Mythical Kingdom). Moscow: Onyx Publishers, 2003. Nestorius and Nestorianism at the Catholic Encyclopedia. This page was last modified on 15 November 2018, at 23:48.